The essay in dark times — Manhattan 1981 — Why birds matter — Save what you love — Capitalism in hyperdrive — May your life be ruined — A friendship — A rooting interest — Rules for the novelist — Missing — The regulars — Invisible losses — Note from 9/13/01 — Postcards from East Africa — The end of the end of the Earth. 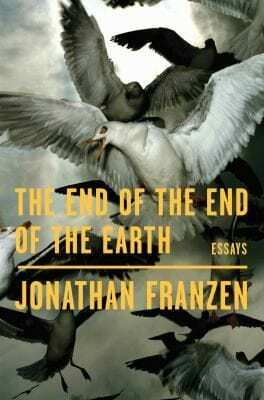 In The End of the End of the Earth, which gathers essays and speeches written mostly in the past five years, Jonathan Franzen returns with renewed vigor to the themes – both human and literary – that have long preoccupied him. Whether exploring his complex relationship with his uncle, recounting his young adulthood in New York, or offering an illuminating look at the global seabird crisis, these pieces contain all the wit and disabused realism that we’ve come to expect from Franzen. Taken together, these essays trace the progress of a unique and mature mind wrestling with itself, with literature, and with some of the most important issues of our day, made more pressing by the current political milieu. The End of the End of the Earth is remarkable, provocative and necessary. In this collection of essays and speeches written mostly in the past five years, Franzen explores his complex relationship with his uncle, recounts his young adulthood in New York, and offers an illuminating look at the global seabird crisis. Taken together, these essays trace the progress of a unique and mature mind wrestling with itself, with literature, and with some of the most important issues of our day. — adapted from info provided.